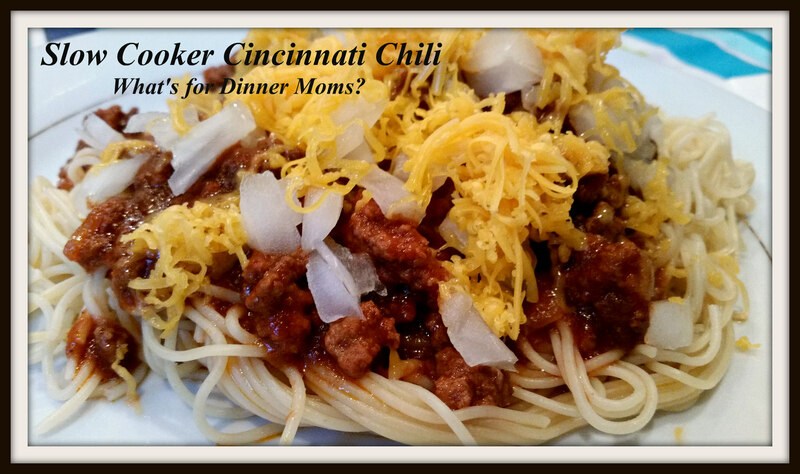 Slow Cooker Cincinnati Chili – What's for Dinner Moms? Now, you know I don’t follow recipes but look at them for suggestions. This recipe called for lean ground beef that was put into the slow cooker raw. I buy 80% lean ground beef because it is $1.99 a pound on sale. If I go up to 90% lean or better ground beef it can be $4.99 a pound or more. Also, I kept wondering how greasy this may be even using a lean ground beef. So, I adapted the recipe to make it with 80% ground beef. To be honest I have never had Cincinnati Chili before so I can’t attest to the authenticity of this recipe. Though I do have to say this dish made my house smell amazing all day long. It had almost a Middle Eastern smell with the cinnamon, cloves and all spice. Everyone that walked in asked what we were having for dinner it smelled so good! This was so good! I served it with diced onions and shredded cheddar cheese on top of spaghetti the way the recipes I saw on line suggested. If you like spicy food I highly suggest adding some hot sauce to your plate as it really brings out the flavors of the cinnamon and cloves. For our mostly gluten-free son serving this over gluten-free spaghetti was perfect. I served this dish with a side of broccoli and a green side salad. In a skillet over medium heat cook the ground beef. Break the beef into small pieces with the side of a spoon as it cooks. Cook it until it is about 2/3 cooked (there may still be some pink in it) and most of the fat has been rendered out. Using a slotted spoon transfer the cooked meat to the slow cooker draining off any fat from it. If you want to remove more fat you can put the meat in a mesh strainer and rinse it first before putting it in the slow cooker. In a bowl mix beef broth, tomato sauce, tomato paste, vinegar, chili powder, cumin, cinnamon, cloves, allspice, salt, pepper, cocoa powder and garlic. Mix until well combined and pour over meat. Add the whole diced onion to the pot. Cover and cook 6-8 hours until meat is cooked and chili is hot. Serve over pasta with shredded cheddar cheese and diced onion if desired. Sounds yummy. I’ll have to try it! Awe, thank you so much, Lynne! This sure looks yummy Marci! I like these slow cooker meals! Nice place! We have visited there several times for Irish Dance Feises (dance competitions). We explore a little bit more each time we go. Love Cincinnati Chili! This looks like a great recipe.Thanks for posting. My husband spent years trying to perfect homemade Cincinnati Chili. The way you served it is called “Four-way.” Spaghetti, chili, onions and cheese. To serve it “Five-way” you add kidney beans on top! I love this stuff, I’ll have to remind hubby to make it again. Yours looks great! Thank you! I am going to stop and have some next time we are in Ohio! I have saved this to make. It’s just cooking the beef up in the morning takes planning. But the spice combination is so intriguing. Thanks for posting this. You could try the lean ground beef method suggested in the original recipe. You break it up in the slow cooker rather than cooking it ahead of time. That may be the way to go. Thanks! Thanks! Hope you like it. It definitely has a Middle Eastern flair but we loved the spices. Oh Know! Another home run from The Cool Aid Mom. I spent 5 years in Cincinnati and I still crave this chili. I use to be a bartender while being a High School Math Teacher. (That alone, my friend, is a very dangerous combo but I digress.) On the weekends, we night owls would pour into Gold Star Chili and order a 5 way. Look it up. There is nothing better for sopping up too much alcohol and provide more laughs than should be allowed. Do Not have this for lunch or you risk the title of Bison Breath. Exit Memory Lane. This is Chili that you can ONLY find in Cincinnati! Try it and see! Lol! Bison Breath, LOVE it! Pingback: 11 Casseroles and Slow Cooker Meals for Busy Nights – What's for Dinner Moms?